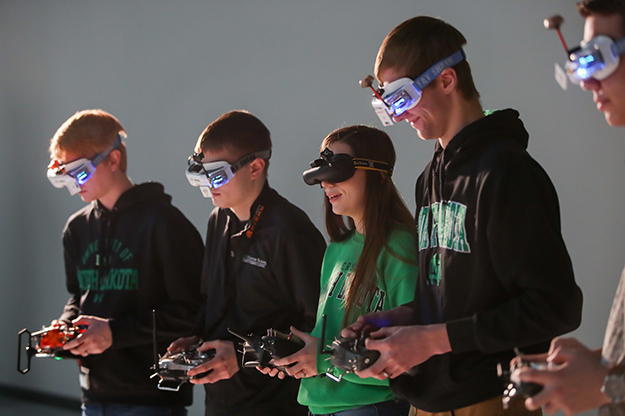 The University of North Dakota is hosting the Collegiate Drone Racing Association’s National Championship this April, drawing the best student UAS pilots in the nation to campus. Photo by Shawna Schill/UND Today. “Excellence in competition” is on the tip of Paul Snyder’s tongue when it comes to the possibilities of unmanned and autonomous systems competitions at UND, such as the Collegiate Drone Racing Championship. It makes sense from his perspective as a faculty member of the John D. Odegard School of Aerospace Sciences. The UND Aerobatic Team recently took home their 10th national championship in 11 seasons. They’ve had an outstanding legacy established under the coaching of Mike Lents. Even more prestigious for UND is the Flying Team, with lead pilots, Cooper Pallasch and Steven Kinney, ranked first and second in the nation last year. The team has finished first or second overall, nationally, in 29 of the past 35 years of SAFECON competitions. Snyder, director of UND’s UAS program, sees unmanned and autonomous systems as the future of UND’s excellence in competition. 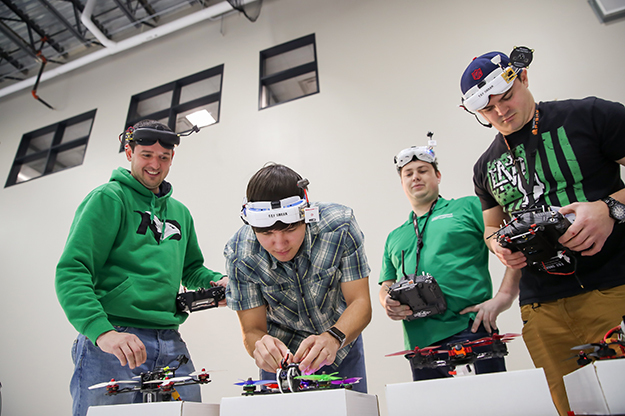 In April, UND will play host to the Collegiate Drone Racing Association’s National Championship – a significant step toward realizing that future. Using goggles that put their vision one-to-one with a camera-equipped UAS, pilots whip around a course at speeds up to 100 miles per hour. Senior Jordan Krueger says it’s the biggest adrenaline rush anyone can get while stationary. Photo by Shawna Schill/UND Today. Two months from now, competitors from up to 25 schools will arrive in Grand Forks to vie for the distinction of best pilot, and racing team, in this growing competition. This will be the third national championship event held for collegiate “first-person-view” drone racing. What is first-person-view (FPV) drone racing? It’s the biggest adrenaline rush anyone can get from sitting in a chair, says senior Jordan Krueger, president of the UND UAS/RC Club. “You’re able to accelerate to 100 miles per hour in two seconds, climb 100 feet with the snap of a finger and fly to places not possible with manned aircraft,” he said. In fact, the drones used in FPV racing can fit in the palm of your hand – equipped with little more than a camera and transmitter. Up to eight competitors go head to head through a course of loops and hairpin turns, among other obstacles, with drones that can pull 25 G’s. Pilots wear goggles that put their vision one-to-one with their aircraft. Last year, with support from both UND Aerospace and the Division of Research & Economic Development, six UND students competed in the national event. Out of 27 teams in attendance, members of the UND UAS/RC Club took home a fifth place overall finish. It’s a new flavor for campus — bringing a sporting nature to unmanned activities, says Mark Askelson, executive director for UND’s Research Institute of Autonomous Systems. He thinks it’s a big opportunity to showcase UND’s UAS prowess. The High Performance Center will be able to transform into a championship-tier racing course for the April event, which will draw students from up to 25 different schools. 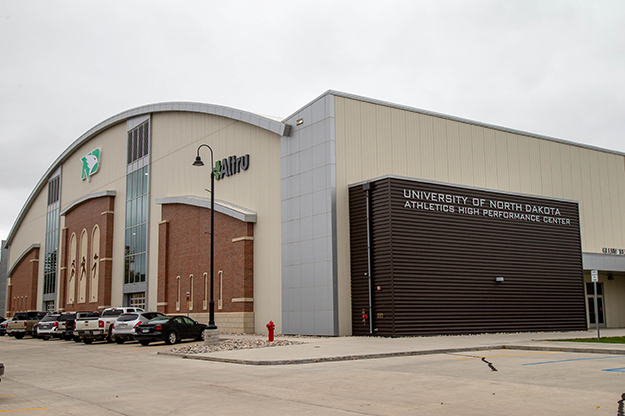 This year’s competition will be held in the UND High Performance Center. The 200,000 square feet of climate-controlled space will seamlessly transform from an athletic training facility to a championship-tier racing course, with bleachers for spectator seating and space for sponsoring exhibitors. With Ray Richards Golf Course reopening with multi-purpose goals in mind, UND’s ability to host drone racing events only has room to expand. The 76-acre space already sees use from area drone racing clubs, as well as the UND UAS/RC Club. The University also envisions Ray Richards as a future UAS test range for students, faculty researchers, private industry and other partners. “We can create the environment to take it to the next level,” said Snyder. For the past three years, Krueger’s been enthralled with racing and engaging drone enthusiasts at UND. He’s one of the best pilots in the nation, having qualified for and raced in the 2018 MultiGP Drone Racing Championship in Las Vegas. Krueger sees UND hosting as a game-changer. Not only will students be able to connect with each other over their passion, but they’ll have the chance to network with the UAS industry at large – exposing them to potential career paths.